Drive Medical Oxygen Carry Bag for Wheelchairs adjust for use with “D” and “E” oxygen cylinders. 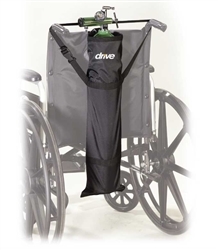 It features top and bottom clasps that easily attach for a secure fit to most manufacturer’s wheelchairs. Made of durable and easy to clean nylon that includes two carry handles. Size 26.5” x 7.5” x 4.75”.